Assessing the damage: Just how bad is it for the Red Sox? An arts group in Southend-on-Sea — a seen-better-days town on the shore of the Thames estuary — invited the New York independent filmmaker Jem Cohen to make a cinematic portrait of the area. The result is Cohen’s 2016 documentary, “World Without End (No Reported Incidents).” Like many of his other works, it can be seen as a series of filmed epiphanies — shots of commonplace objects, scenes, and people caught at just the right moment and in just the right light to be revelatory. Streetlights on a curve of road glow orange; a close-up of a peacock’s head is rivaled by a shot of a dead pigeon, its iridescent feathers shining gemlike in the passing lights of traffic; a speck of a little boy plays far off in the estuary mud flats, which seem to stretch on forever in the ebb tide. Cohen also interviews some of the inhabitants, and they are also an odd assortment: an elderly woman who recalls how townspeople sailed out on their boats to rescue the troops from Dunkirk; a native of India who lost his Lehman Brothers job in the 2008 financial disaster and now dreams of opening a world-wide chain of fast food curry shops; and the dapper proprietor of a richly stocked hat shop who demonstrates how Frank Sinatra angled his fedora just so to project the maximum of style. “World Without End (No Reported Incidents)” screens on Friday at 7 p.m. at the Harvard Film Archive as part of the series “Jem Cohen, Present And Adrift” (Through May 14). 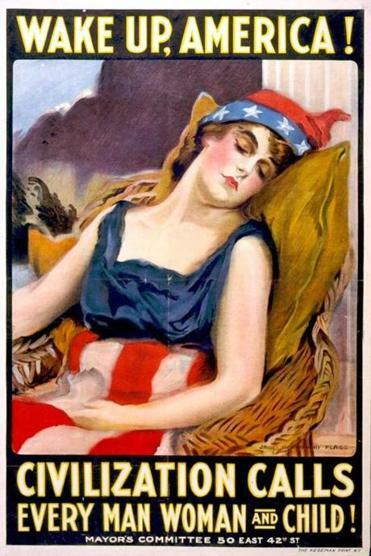 One hundred years ago this month, the United States entered World War I, which had already been raging in Europe since 1914. The conflict would rage another 19 months, ultimately claiming 15 million lives. The series is especially illuminating in showing the events, people, and policy that nudged the nation to war. It also draws parallels to such contemporary issues as immigration and the conflict between national security and civil liberties. Most impressively, through archival photos and footage, testimony from participants and commentary from experts, it tries to depict the enormity of the destructiveness and suffering in a nightmare that saw 100,000 Americans killed in action or by disease. “The Great War” airs on PBS Monday through Wednesday at 9 p.m. It will also be available on DVD from PBS Distribution at ShopPBS.org. Online viewing begins Tuesday at PBS.org. For more information go to www.pbs.org/wgbh/americanexperience/films/great-war. Martin Doblmeier’s documentary “An American Conscience: The Reinhold Niebuhr Story” explores the life, times, and mind of the person perhaps known best for the “Serenity Prayer” (the one beginning “God, grant me the serenity to accept the things I cannot change. . .”). Using archival material and interviews with Cornel West, Andrew Young, David Brooks, and many internationally recognized historians and theologians, the film demonstrates that more than just preaching serenity, Niebuhr sought to disrupt complacency and promote an engagement with the world. “An American Conscience” premieres on the PBS World Channel on April 16 at 9 p.m.
For more information go to worldchannel.org/programs/episode/american-conscience-reinhold-niebuhr. Isolated in the middle of the North Atlantic between Norway and Iceland, the Faroe Islands, an autonomous state within the Danish Realm with a population of around 50,000, possess natural beauty, but their rocky soil offers little in the way of resources. So the inhabitants have traditionally turned to the sea for their needs, trapping seabirds, fishing for salmon, and hunting for whales. The latter has drawn the protests of activists for saving the whales, though the Faroese point out that the whale population they hunt is sustainable. But the greater threat comes from the whales themselves — marine pollution has made their meat toxic. Day’s film is like an update of Robert Flaherty’s classic documentary “Man of Aran” (1934) — a tale of beleaguered islanders whose old ways are challenged by progress. This time, though, the threat is far more complex and dire and is faced not just by the Faroe Islands, but by all of us. “The Islands and the Whales” screens as part of the DocYard series Monday at 7 p.m. at the Brattle Theatre. The director will be present for a discussion. For more information go to www.brattlefilm.org/2017/04/10/the-islands-and-the-whales.